Bellingham, Washington, population 75,750 (2008), is located on a bay in the Straight of Georgia, 20 miles south of the U.S. border with Canada. 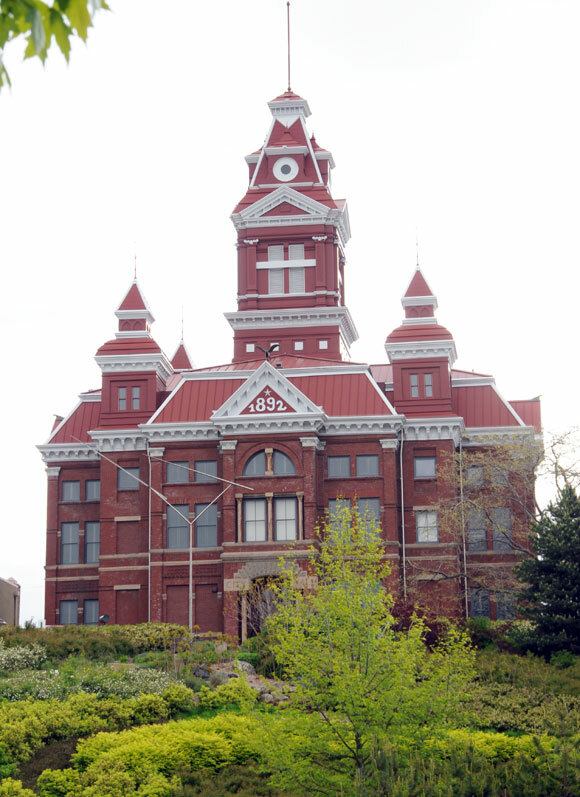 It is the largest city in Whatcom County and the county seat. Whatcom County has a TDR program designed in part to protect the watershed of Lake Whatcom, a lake that is partly within the City and partly within the County which provides drinking water to much of the city and county. Bellingham allows developers bonus development though at least three variations of transferable development rights as described below. Historic City Hall presides over the Old Town Overlay District, a receiving area for one of Bellingham’s TDR mechanisms. Bellingham’s Old Town District is roughly a half square mile area in the city center which includes a park, Whatcom Creek and numerous historic structures including the historic City Hall. The Old Town Overlay District Development Regulations limit floor area ratio (FAR) to 3.5 square feet of floor area for each square foot of lot area. However, a maximum limit of FAR 5.0 is possible when developers use floor area transfer and bonuses. Floor area transfer can be approved by the Planning Director when two sites are part of a single development, when the plans for the sending and receiving sites are reviewed concurrently and when the amount of transferred floor area is recorded on the deeds of the sending and receiving sites. The code does not appear to require sending and receiving sites to be contiguous or under common ownership, making this a potential TDR mechanism. Also within the Old Town District, floor area bonus can be granted to projects that provide open space and/or plazas, affordable housing, sustainable building design (minimum LEED Silver certification) or participation in the Lake Whatcom Watershed Property Acquisition Program (LWWPAP). Under the LWWPAP Bonus Option, developments are awarded one square foot of bonus floor area in return for securing the preservation of one square foot of land in the watershed. Compliance must be made via in-lieu payment of an amount established by City Council resolution. A 2007 study determined that $12 per square foot would be a reasonable ratio. A maximum bonus of 0.5 FAR can be achieved by the LWWPAP bonus program although the maximum bonus achievable through all four options is 1.5 FAR and the maximum FAR with bonuses is 5.0. Of significance is the fact that developers who want to use the LWWPAP option in Old Town must make the in-lieu payment. This observer knows of only two other programs like this: Gorham, Maine and Hatfield, Massachusetts. In the ten other TDR programs known to use cash-in-lieu payments, the developer at least has a nominal choice of complying with cash or actual TDRs. The Bellingham code also allows a third form of TDR through a density bonus mechanism found in the Cluster Subdivision chapter of its subdivision code (18.32.050). In this mechanism, a density bonus of up to 50 percent can be granted by a hearing examiner to a receiving site meeting any of three criteria: 1) A parcel determined to be a suitable density donor by the City Council; 2) A planned development that provides for development rights transfer; or 3) A parcel previously zoned for residential uses that, due to subsequent regulations is unlikely to achieve 50 percent of its original allowable density. (The code section also provides density bonus for specified project features including affordable housing, neighborhood parks, additional open space, restoration of natural areas, increased buffer areas and the revitalization of blighted areas.) Bellingham’s location-specific zoning districts determine whether or not development can use these provisions. For example, the King Mountain neighborhood zoning district contains 11 subareas. The TDR mechanism described above is allowed in five of these subareas. In a March 25, 2009 article in theBellingham Herald, Jared Paben reported that only one developer, Ralph Black, had used the TDR provisions so far. The receiving site is in the Stonecrest development in the King Mountain zoning district near east Bakerview and Irongate roads. Black created TDRs by recording easements on land that he owns in the Lake Whatcom watershed. Although he was able to transfer nine TDRs to the Stonecrest development, Black reported that the neighbors near the receiving site fought the proposal when it came time for the City Council to approve the project. According to the article, Black claims that he would not go though the current procedure as it existed in March of 2009 because developers need to be able to use their TDRs when they meet established preconditions. In January 2009, the consulting firm of Property Counselors completed a study for the City of Bellingham addressing the use of expanded and/or modified TDR mechanisms in areas that are annexed into Bellingham. The report concludes that demand for TDRs is likely to remain low for the next decade because developers are not building up to the baseline densities allowed in the receiving areas without the use of TDR. Specifically, the study looked at 11 recent developments and found that developers were building to only 43 percent of the number of houses allowed without using TDR. Many developers are unable to achieve even baseline density because of environmental constraints that make portions of their land unsuitable for development. Nevertheless, the report concludes that a TDR mechanism should still be adopted for areas annexed to the City because future changes in the availability of developable land could increase demand for TDRs eventually. The study claims that most receiving area developers currently believe that TDRs have little or no value. Consequently the study suggests that the City could make TDRs more attractive with a ten-to-one transfer ratio, meaning allowing ten TDRs to be used at a receiving site for each TDR transferred from a sending site. Under this proposed formula, a market might be created if sending area property owners are willing to accept $30,000 for each sending area development right foregone and receiving area developers are willing to pay $3,000 for each additional receiving area development right. The March 25, 2009 article cited above ends by saying that the Bellingham planning staff expects to propose a mechanism for these areas that sounds similar to the one already in place for Old Town. Specifically, developers would be allowed to achieve bonus density by making a cash payment in lieu of TDRs and the City would then use that revenue to purchase land or development rights in the Lake Whatcom watershed.